So a few days after the #FashionWithoutBoarders main event at the #ParkInn in Sandton which attracted many industry professionals, #MochaChic received an invitation from #Vodacom to participate in a private fashion show which would be organised and hosted by Vodacom at #Vodaworld. We delivered on both accounts and the love from the models, organizers and the crowd was overwhelming. Personally I’ve been trying to select a favorite outfit but its impossible because even though they are of the same colour, they are very different and appeal to me in much the same way which in that, they are flirty and confident. If I had the body for it I would wear all of them with equal frequency. I think what has made every piece a favourite for me is that they reflect who I am as an individual. I love this passion colour and it’s already in most areas of Mocha Chic’s life, so using it in different textures and hues all at the same time was an extra bonus because again, the fabric types were those I most strongly resonate with. I love soft, feminine fashion crafted in strongly structured lines. And I feel like this is exactly what I got out of this project, each piece has a small element of severity whether in design or fabric choice. I guess this collection should in essence be called the: Wendy by Night Collection, because it really is everything I would wear and wish I could wear. Thank you for visiting Mocha Chic and I’d love to get feedback from you about this post. I apologise in advance for poor image quality. We are at the end of yet another awesome week and to end it here is an update on current affairs at our studio. 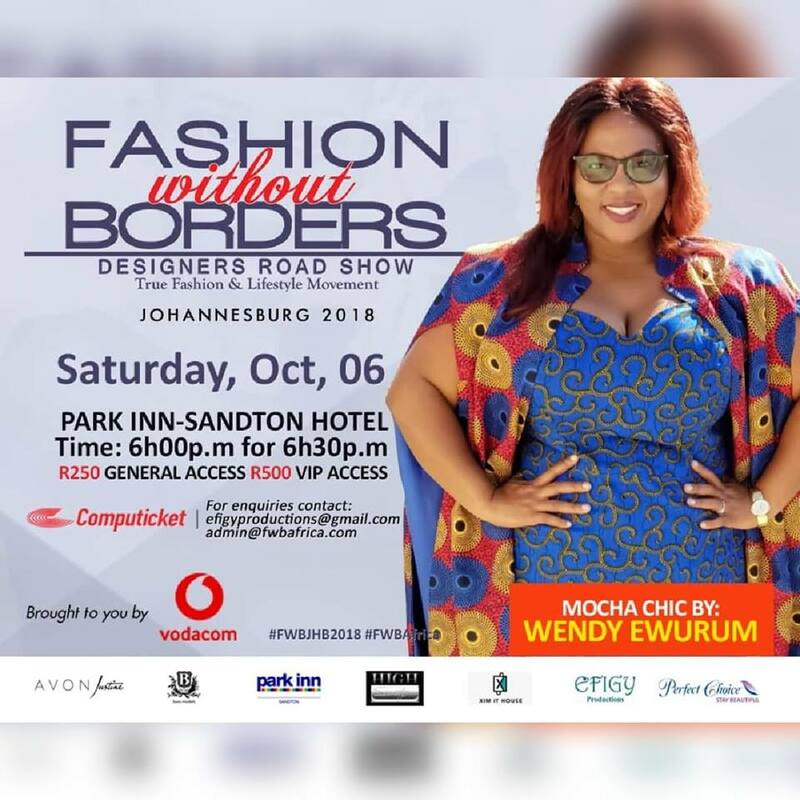 If you have been reading the blog, you’d have noted that we had a fashion event scheduled for Saturday the 6th at #ParkInn Sandton, hosted by #FashionWithoutBordersSA ( #fwbjhb2018). This was an incredibly reassuring experience for the brand because the whole process just reaffirmed that we have a place in the South African fashion landscape. Not that we ever had a doubt, but when industry professionals start taking note and saying well one…. well, it most definitely carries a certain weight. I’ve always known what I wanted to create through this brand. Clothes that say she is wearing a bespoke garment that personifies elegance, class and style and has her feeling her most powerful and confident self. As a result I do my very best everyday to communicate my intention through the clothes I produce, especially the quality in the execution of each garment. As a creative my focus has never been on making outrageously exotic fashion that would be limited to runways and speciality wear audiences. My choice of “genre” or style is one that set out to provide a solution to a problem I had and in solving my problem found out that many other women shared my struggle. Therefore at Mocha Chic we came to be the place where every woman can walk in with the knowledge and assurance that she will come out with a tailor made or even ready to wear item that fits her to perfection complete with the best garment finishing. That we are now invited to actually participate in fashion events is a cherry on top and I cannot express my gratitude and joy enough with these new developments and we look forward to many more such breathtaking projects. Please don’t forget to subscribe to our YOU TUBE channel. Watch this space for details on the #VodacomRed project…..